This week has been hard, in many ways. I was on a roll with the morning pages, until I forgot once, and then ten days passed until I got back to it, and I completely forgot to do the affirmations. I’m not happy with how long it’s taken to get through this week; since taking up an evening class, the time I have to work on the weekly tasks seems to have gone down dramatically. I need to organise my time better, to make space to do the weekly tasks, but also to make time for myself. The ideal childhood and day tasks were fun and I have some ideas of how I can pursue integrating elements of them into my life – when the same desire (structured lessons, more time to do studies and materials practice) comes up in three separate exercises, I should probably act on it! As I said my morning pages have huge gaps in them where I fell off the waggon and struggled to get back on. My routine had been to write while eating breakfast at work, but as soon as the weekend hit, everything fell apart. And writing t work is dependent on who gets in early and how chatty they’re feeling – but that’s on me, not them. I’m trying to write something introspective in a public place and it’s unreasonable to expect other people not to have a conversation (especially when we’re friends and I am usually interested in what they have going on). Having moved desks again (the second time in three weeks), hopefully the new space will offer a little more seclusion. My office-mates aren’t such obnoxiously early risers as I am, so maybe I’ll get half an hour to write my brain-dump before I need to interact with people like an adult. I leaned about nålebinding this ‘week’, and gave it a go. 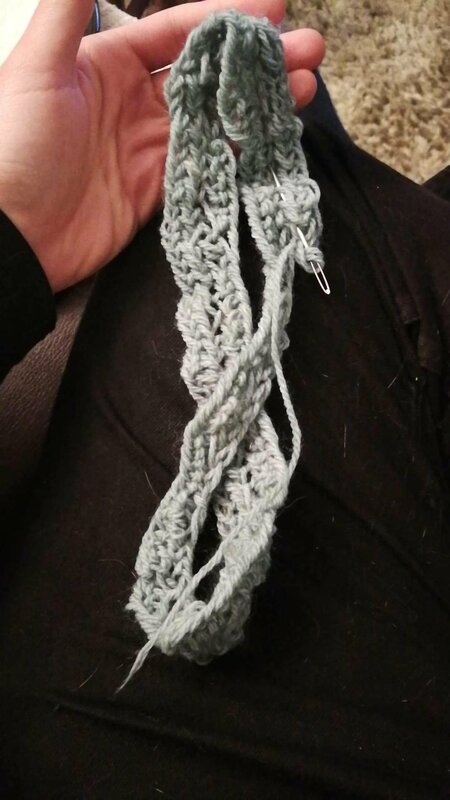 It’s my first ever attempt at anything like this – I’ve never been into fibre crafts – but it doesn’t require a lot of complicated stuff – just a ball of wool, a wool needle, and time. 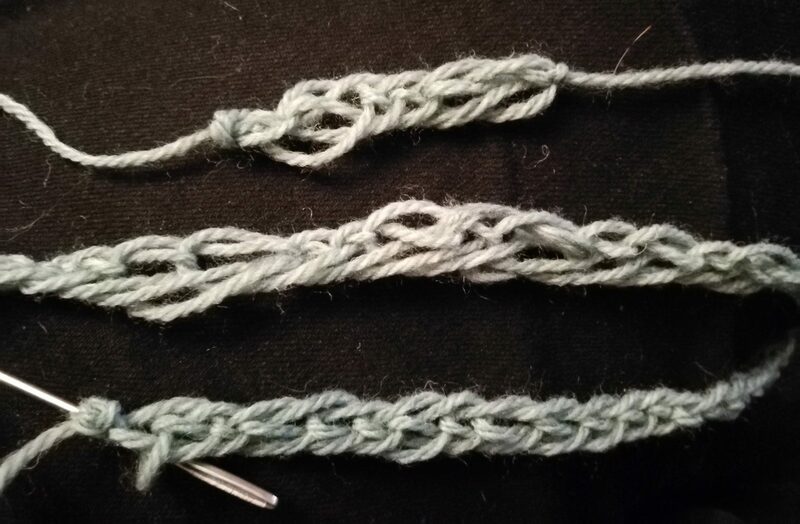 First attempt on the top, latest attempt on the bottom – definite progress is being made in terms to stitch quality and consistency. Unsuprisingly, I’m rubbish at it. My stitches are uneven and the one time I tried to make a thing (instead of a chain of stitches), I fastened the wrong sides together and made a Möbius strip. So much for a hat; guess it’s a fancy neckwarmer now! I’m going to keep going. My stitches have improved already and a neckwarmer will be useful as winter draws in. Maybe I’ll felt it to make it windproof (but that’s a whole new skill I have yet to learn). I’m pleased with my new skill, and I love that I’m making something practical for a change. I’m clearly hankering after more structure to my artwork and less charging ahead with finished pieces that are ultimately unsatisfying in their execution. Such morning pages as I wrote are offering a window into my mental health status, so there’s some self-care to do, too. Although I’m not consistent, I am glad I’m doing them. If I want to finish the course before the end of the year, I needs to schedule my time better. I’m still playing with new things and kicking around new ideas, so something’s bedding in. I’m aiming to finish Week Nine in a fortnight with a full set of morning pages – watch this space!